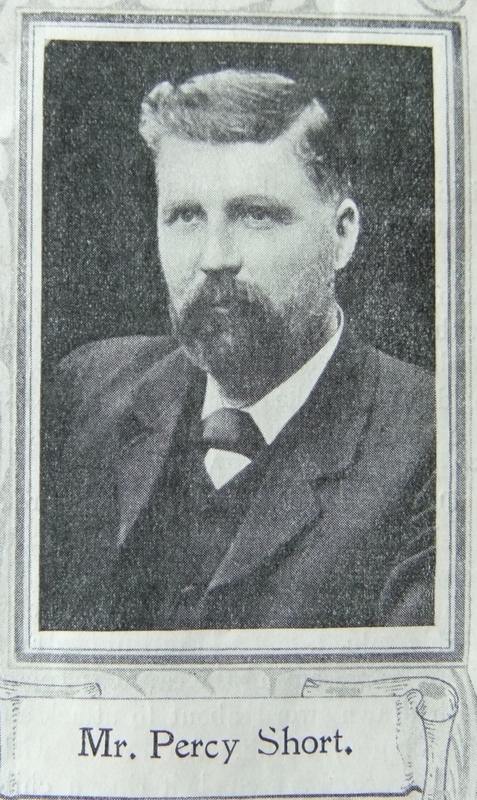 Mr Percy Short, the Circuit Steward of Bristol Sixth, is a loyal Primitive Methodist, a very fervent and useful local preacher, and in a prayer meeting a tower of strength. He is exceedingly generous and has a most tender heart. The Church in many ways has honoured him and God has given him material prosperity. Converted at the age of twenty-two, during the ministry of the Rev. James Richards at Cirencester, he joined the Church and came on the plan where his father served before him. From that time he has rendered unbroken service, eleven years being spent in Gloucester where the friends on his removal to Bristol presented him with a framed illuminated address. He has known sorrow. In April, 2005, his youngest child died. This nearly broke his heart, and he felt he could not preach, but time has brought to him a new outlook, a mellowed experience, and a strengthened call to the light beyond. Percy was born in 1859 at Bagendon, nr Cirencester, Gloucestershire, to parents John and Elizabeth. John worked the land. Percy was baptised on 10 April 1859 at Bagendon. Percy initially followed his father as an agricultural labourer (1881), starting work at the age of ten, but following his conversion, by the time of the 1891 census he had become a superintendent for an assurance company. For many years he held the post of divisional manager. In Bristol, Percy was associated with the Eastville PM Church. His obituary records that Percy was a great soul, delighting in acts of kindness and in Christian service, and his service for the church of Christ is inestimable. Percy married Elizabeth Whiteman Scrivens (abt1860-1951) circa 1879/80. Census returns identify six of eight children. Percy died on 8 May 1932 at Fishponds, Bristol, Gloucestershire.